This summer I got a dynamite idea from Rebecka Perterson at TMC14. The premise is that students have the option of writing you a letter on Fridays instead of doing the Warm Up or bell work activity. Then, no matter how short or how long their letter, you write them back and give it to them on Monday. 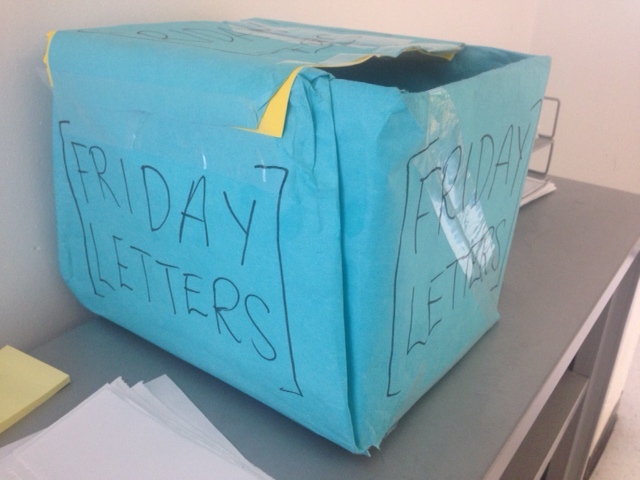 When I first informed the students about Friday letters, I could see a refreshing look on most of their faces. But things got even more interesting when told them I would respond to every letter I received. Without one letter being written, I could tell I had already made a lasting impression. Last week was the first Friday the students had the opportunity to write me. I provided the kids with 1/4 sheets of paper and post it notes for those that chose to write. I received 17 letters, which I was stoked about. For the most part they were light hearted, things like “I really like your class so far” to “What’s your favorite color?” to “The first Varsity basketball game is December 3, can you come?” I thoroughly enjoyed reading and responding to them all. I suspect the letters will get more intriguing as the year goes on. Friday letters opens up a private line of communication with my students that I’ve never had before. I’d like to think that my communication was always pretty good, but Friday letters adds a new dimension. It allows students to communicate to me their questions, feelings, and thoughts in a way that is accessible, non-judgmental, and meaningful. They feel that their voice is heard while getting individual attention from me. Plus, I really get to know my kids, which I love…they’re all so unique. This will really afford me the opportunity to learn who they are as people and tap into their strengths. How will this ultimately effect my classroom this year? Will students just eventually stop writing and be “over” it? We’ll see. I’d love to hear similar things that other teachers have done to open up this type of communication with their kids. This entry was posted in reflection, strategy and tagged communication, letters by brian. Bookmark the permalink.